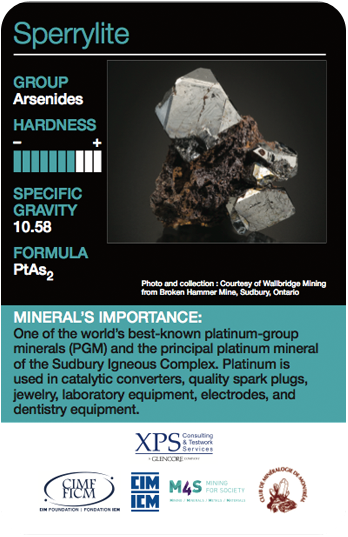 The printing and distribution of this card is sponsored by: The XPS Consulting & Testwork Services, A GLENCORE Company, Falconbridge, Ontario, Canada P0M 1S0. XPS technicians, metallurgists, engineers and geoscientists have experience in operations or mineral exploration and mining. Using our technical strength and operations experience enables us to deliver practical and successful flowsheets and processing solutions. Process Mineralogy & Plant Support – mineral processing, mineralogy, sampling and applied statistics. Extractive Metallurgy – hydrometallurgical and pyrometallurgical testing, process modeling, and on-site support. Process Control – process control and automation technologies, and engineering solutions. Materials Technology – materials engineering for the selection and testing of materials of construction, failure analysis and equipment monitoring. Our method and approach has been proven to add value and reduce risk. XPS Consulting & Testwork services is wholly owned by Glencore, itself traded on the LSE http://www.glencore.com/investors/shareholder-centre/lse-listing/ (also on: HKEX, and JSE). Glencore (www.glencore.com ) is one of the world’s largest global diversified natural resource companies. As a leading integrated producer and marketer of commodities with a well-balanced portfolio of diverse industrial assets, we are strongly positioned to capture value at every stage of the supply chain, from sourcing materials deep underground to delivering products to an international customer base. The Group’s industrial and marketing activities are supported by a global network of more than 90 offices located in over 50 countries. The Group’s diversified operations comprise over 150 mining and metallurgical sites, offshore oil production assets, farms and agricultural facilities. We employ approximately 200,000 people, including contractors. For additional information about XPS Consulting & Testwork Services and their contributions to the mining industry please visit their website at http://www.xps.ca.